Space Needle is the highpoint of the Bridge Canyon Wilderness found in the southernmost tip of Nevada. It had first been brought to my attention a few months earlier by Bob Sumner who had mentioned that it was the most difficult Wilderness HP in the country and possibly unclimbable. A few days before I was heading to Las Vegas for a volleyball tournment my daughter was playing in, I'd contacted Courtney Purcell to see if he was available for some scrambling in the area before or after the tournament. He mentioned that he already had some plans for which Matthew had driven out to Las Vegas, encouraging me to join them. One of these was a visit to Space Needle where they planned to bring an aluminum ladder, a crossbow and Dangerous Dan, an accomplished climber who was bringing gear to aid the route by whatever means necessary. Normally I would have been unable to join them since I had volleyball for half the day, but this one seemed too good to pass up - who doesn't want to see a summit climbed with the use of a crossbow? My daughter would have to understand that this was worth missing a few matches for. In the end we didn't use the crossbow at all, but we did find a way up the summit thanks to Dan's aiding skills, which made for a most interesting of days. The weather had been poor in the Las Vegas area, in fact all of the Southwest Desert region with an unusual storm that brought significant precipitation to an ordinarily parched landscape. The weather was on the mend with clearing skies in Las Vegas as I drove south in the early morning hour, but the clouds still held a firm grip in the Newberry Mountains where our summit was located and the sun would be in very short supply today. It would even rain some today, but though combined with a cold wind, it was not enough to discourage the group, or at least most of us. Bob Sumner had driven more than five hours from Hawthorne, NV to join us, arrived hours early, found it raining and decided to continue on to Los Angeles where he was due that evening. He assumed there was no way it was going to happen today, but in the end, it did. The rock on Space Needle is primarily granite which holds together well when wet, unlike sandstone which would have probably required us to reschedule. There were 11 of us that met at the junction of US95 and Christmas Tree Pass Rd around 9a. DB and Nga decided to forgo the adventure due to the inclement weather, but the other nine of us went about collecting, distributing and packing the promised assortment of gear that would be needed for the seige effort. In five vehicles we drove up and over Christmas Tree Pass to a turnout less than half a mile from Space Needle, northwest of the summit that was invisible through the thick clouds. While we were preparing to head out, we got a visit from a friendly NPS ranger driving by, stopping to see what we were up to, make sure we weren't doing anything untoward in the Wilderness and give some of the usual ranger advice. After departing we gathered for a group shot before striking off on our quest. Courtney and Tracy had made an earlier visit to Space Needle, several in fact, trying to work out a backside route to the summit (the large East Face had several 5.10b routes that were a bit stiff for us scrambling types). On their second visit they had brought the ladder which allowed them to overcome a formidable, difficult-to-protect overhang on the west side of the summit block. They had climbed only a short distance above this before finding a last 20-foot vertical wall that exceeded their abilities. Dan was enlisted to aid this final section, possibly with the help of a bolt kit should it prove necessary. Failing this, the crossbow was intended to be used to shoot a thin line over the summit block and somehow use this to drag a climbing rope over the top and secure it as another means of ascent. It took just over half an hour to make our way from the parking area to the base of Space Needle. Even with the poor visibility, it did not appear that the summit in any way resembled the famous Seattle landmark, but it was impressive nonetheless. There are two class 3 scrambling sections below the ladder placement and by various means (there is an awkward tunnel that a few used and through which the ladder was passed, or a hand-line assisted friction climb to the right of the tunnel) we made it past the first 30-foot section to the shorter upper section where some exposure makes the effort a bit nervy and for which we would fix a second line for those that wanted it. While eight of us were making our way through these two sections, Tracy was down below, apparently a bit lost, wandering around the foggy landscape further north than he should have been. While Tracy had started later than the rest of us on the hike in, Courtney had assured us that Tracy had been here before and knew his way, so we didn't worry all that much. A phone call finally established a connection with our misplaced comrade and by means of shouts at irregular intervals, he eventually found us through the mist some half an hour or so later. Meanwhile, as we were trying to reel Tracy back into the fold, Dan and Double A had gone up the ladder to begin the 20-foot aid section. Dan was encouraged by the crack he found running through a small roof to the summit, allowing him to make use of pitons and other protection without resorting to the bolt kit. His effort would be slow, requiring an hour and a half to place maybe 7-8 pieces, much of it hanging from stirrups (aiders) brought for the purpose. Six of us (seven, once Tracy joined us) did our best to wait in a small alcove behind the ladder, thankfully out of the wind and under a roof protected from any rain that might fall. Ever antsy, I had trouble sitting still and wandered about the limited terrain, first helping to locate Tracy and fixing the ropes that helped him up the two scramble sections (he was carrying the crossbow which made for awkward climbing). I went up the ladder several times to visit Double A and Dan, the latter who I found to be in his element and enjoying his work a great deal. My constant movement and abundance of clothing (I had fortuitously brought multiple jackets and paired gloves in addition to the usual fleece and balaclava and I never got uncomfortably cold) helped me immensely. Others did not seem to fair quite as well including Matthew and Walt for whom the cold was making them somewhat miserable. Once Dan had made his way to the summit it was time to ferry the rest of us up. Double A went first, followed by Harlan, using a combination of ascenders and holds facilitated by the aiders Dan had left hanging in the crack at the halfway point. Neither made it look particularly easy, each requiring about 20min with multiple attempts to get over the roof. The hard part was getting the ascenders past the pressure points where one has to unweight the main rope first. After watching their efforts and understanding some of the nuances, I had Harlan drop his ascenders back down on a static rope so that I could use them on my own effort. They were constructed of two small metal ascenders (Camp Solo2) with special autoblock rope attached, a shorter one to connect to my climbing harness and the other for a footstep. It worked nicely, inching my way up about 8ft in 5-6 series of first moving one ascender, then the other. At the lip of the overhang I used my left hand to grab the aiders and unweight the rope to get the ascenders past this point. This seemed to work much better than awkwardly trying to step into the aiders as the others had done. I had left my pack below to make things easier and in about five minutes' time I had joined the others on top. The rope I had carried had been hauled up ahead of me and once at the summit I used a few carabiners to clip into the bolted summit anchor and lower a rope for rappel. I had suggested a rappel rope separate from the ascending line in order to facilitate getting our large group up and down in quicker fashion. I don't think I was on top more than a minute before rapping back down, grabbing my pack and descending the ladder to join the others at the alcove. Once I was back down, I learned that Tom was going to be content not to try the aided ascent. Walt was feeling likewise, declaring he was far too cold to try the ascent. Matthew, having not moved from his huddled position in the alcove for some time, also decided to forgo the summit - too many folks and too much time had passed and it no longer looked like fun. That left Tracy and Courtney as the only other two to try the ascent after myself. Tracy was making his own attempt at the roof, struggling as much as anyone when I suggested to the other three that we might go climb Spirit Mtn as consolation. 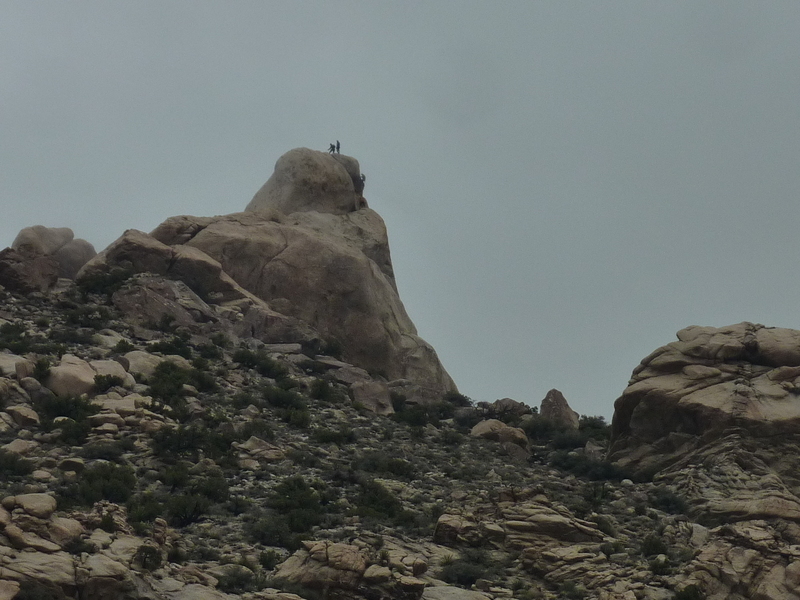 All three of them thought that a far better idea than sitting around for another hour or more for the climbing and rappelling to be completed. With three atop the summit, Tracy slowly making progress and Courtney below him waiting his turn, I pulled the rappel rope so that we could use it to aid the class 3 downclimbs (there were other ropes at the summit block that could be used in its stead), and four of us headed down. It was 2:15p when we had our last look back at Space Needle before losing it to the clouds, three of our party silhouetted at or near the summit. Back at the vehicles, we met up briefly with DB and Nga who were waiting patiently there for the expedition to finish. Matthew wasn't much interested in climbing Spirit because he'd already climbed it with me years earlier. I wasn't all that interested myself, but felt like I needed to give Tom something to recover from the disappointment on Space Needle, Walt joining us for the same reason. I had hoped that the outing would have finished hours earlier to give me time to get back to Las Vegas for the tournament. I'd already gotten texts from my daughter and wife wondering where I was, and replied to them that I would be some time still, not without a healthy dose of guilt. It was with this in mind that I went about setting a pretty stiff pace up Spirit, once we had driven back up to Christmas Tree Pass in Tom's Jeep and set out from the standard DPS trailhead found nearby. I had almost no recollection of the route when we started out, but Tom had done some reading beforehand, enough to recognize the key gendarme we needed to ascend to once we'd gotten over the low, intial pass above the TH. We soon picked up the well-ducked route that leads all the way to the summit, mostly a class 1-2 effort with really just one short class 3 move needed near the top. We had hoped that the expected clearing would leave us some views from the summit which I had told the others was one of the best in the state, a fine perch from which to take in scenes from three states, including a great one of the Colorado River around Lake Mohave and the Laughlin area. No such clearing developed, our short stay at the summit frigid and windy, with just enough time to sign the register and find my old entry from 2008. Our roundtrip time for the 4mi, 2,000ft effort was a bit under 3hrs, getting us back to the Jeep around 5:20p. Eventually the others got ahold of Harlan and arranged to meet at Railroad Pass to hand the keys back. The next day, which I missed, much of the same group made an attempt on Thumb Butte, a far more serious effort than Space Needle it seemed, and they were unsuccessful. Much thanks goes to Courtney for coordinating such a large group for the weekend and extra thanks to Dan for his skill in aid climbing, without which none of us would have made the summit of Space Needle. 1) using the etriers-- when I weighted the etriers, the carabiner they were attached to was tightly pressed against the rope, making it hard to slip the ascender past. 2) My gloves! The liner came free from the outside, so I had floppy fingers! 3) I had tiny carabiners on the ascenders, for use in vertical ascents-- and they kept catching on the lip. When I looked at the ascenders later on, one was missing -- so I may have ripped it off. Good riddance! But you missed the most amazing clusterf*. I saw that CP was having trouble rigging his ascenders, so went up again with just one ascender. When he was finally set up, I warned him about the etriers, and stood on my tippy-toes to help catch any slipping feet. Then the rock I was standing on slipped and I was hung up on one ascender! No matter, I had a prusik I could use to unweight the ascender. But I had brought a short prusik! So I was about to grab the protection to unweight the ascender, ... when Dan came down removing the protection! Not one of my shining moments. I was ready to cut myself out. So far it is the hardest Wild HP I am aware of! Way to get at it. I made it to the ladder location, once, naively thinking I had to be able to find a way up it with enough persistence.